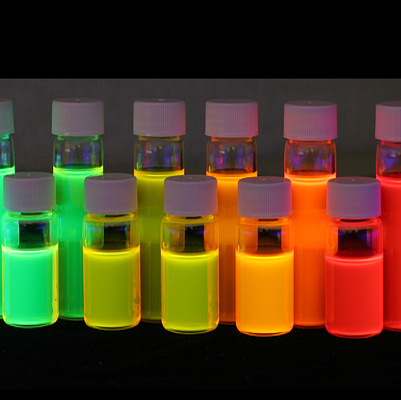 Cd Free Quantum Dots are composed of CuInZnS cores surrounded by a shell of ZnS and are offered as an alternative to Cd based quantum dots (QDs) where potential toxicity is a concern. Three different water soluble forms are coated with hydrophilic surfactants to achieve dispersion in water. The three different water soluble forms have surfactant terminal end groups that are either a carboxylic acid (-COOH), a primary amine (-NH2), or a diol (-CHOH-CH2OH). These Cd free QDs provide the high brightness, strong optical absorbance over a wide excitation wavelength range, and photostability characteristic of all quantum dots. Pricing begins at $299 for 10 mg.
Cd Free Quantum Dots are composed of CuInZnS cores surrounded by a shell of ZnS. These CuInZnS/ZnS nanocrystals are offered as an alternative to Cd based quantum dots (QDs) where potential toxicity is a concern. 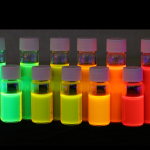 NOM CuInZnS/ZnS QDs provide the high brightness, strong optical absorbance over a wide excitation wavelength range, and photostability characteristic of all quantum dots. The emission bandwidths of the Cd free QDs are wider than Cd based QDs but are less than 100 nm for all wavelengths. Three different water soluble forms are coated with hydrophilic surfactants to achieve dispersion in water. The three different water soluble forms have surfactant terminal end groups that are either a carboxylic acid (-COOH), a primary amine amine (-NH2), or a diol (-CHOH-CH2OH). These coatings allow covalent bonding of the QDs to a variety of molecular probes for many fluorescent labeling applications.